During the Age of Exploration in the 16th century, Japan was responsible for a third of the world’s production of silver, and most of that came from Iwami Ginzan. It was to the point that the mine showed up in world maps created in Europe at that time. One characteristic is that it existed side-by-side with the natural environment. That is an important point that has been praised as a World Heritage site. The heritage site is divided into the three areas of The Remains of Iwami Ginzan And Mining Town, The Highway, and The Port And Port Town. Since the area is extremely large, it’s good to take the 2 courses beginning from Iwami Ginzan Park in the center of the town which also has a tourist information office. At the north end of the park, the one-way 2.3km Silver Mine Course follows 2 walking trails (Silver Lanes) which sandwich the main route and the river. Along the main route, there is a temple, a silverworks shop, and a café among other facilities, and while enjoying the woods along the walking trails, you can view what remains of the Shimizu Refinery. The goal is Ryugenji Mabu. A mabu refers to the tunnel through which the silver is mined. At Iwami Ginzan, there are about 600 mabu of varying sizes but only Ryugenji and Okubo are open to the public (Okubo is only periodically open with the number of entrants restricted). Within its total length of 600m, sightseeing is restricted from the entrance to the 157-meter point. There are traces of fleas on the walls and the sight of the mining from those days is plainly evident. At the southern edge of Iwami Ginzan Park to your right, there is a townscape walking course which includes many valuable buildings such as the only open samurai residence of the Old Kawashima House as well as the merchant house, the House of the Kumagai Family. Just strolling is enjoyable when you come across cafes inside restored old houses and handmade accessories. The Adachi Museum of Art first opened in 1970 under the aegis of self-made businessman Zenko Adachi who had been born in the area. The main characteristic of the museum is that the major works of Japanese painting master, Taikan Yokoyama, make up such a large part of the exhibition that it can be called the Taikan Museum of Art. 120 of his famous works including “Autumn Leaves” and “Mountain After A Shower” are at the museum which provides a great amount of quantity and quality. Also, there are children’s paintings, pottery, wooden sculptures and the works of other famed contemporary Japanese artists. In accordance with the changing of the four seasons in the garden, the year is divided into 4 periods of exhibition to the public. In place of picture frames, the windows themselves provide views into the garden and with features such as “The Living Scroll” in which the outside gardens can be seen with the walls of the tokonoma alcoves taken out, the museum focuses on a presentation style which relates the message of “Being moved by beauty”. Zenko Adachi believed that “The garden is also a picture”, and he himself went all around the country to amass rocks, pine trees and other examples of nature. Among the 6 gardens, the Dry Landscape Garden and the White Gravel and Pine Garden are especially popular. The elegant Dry Landscape Garden with its white sand and powerful arrangement of stones is like something out of an India-ink painting. And the scenery of flowing gravel at the tasteful White Gravel and Pine Garden takes on the motif of one of Yokoyama’s works, “Beautiful Pine Beach”. There is a dynamic expression from the large and small pine trees situated on the white gravel which leaves a deep impression upon all who visit. An American journal specializing in Japanese gardens has ranked it at No. 1, and the travel guide Michelin Green Guide Japon gave the highest ranking of 3 stars. The azalea of spring, the fresh leaves of summer, the colors of autumn and the snowscapes of winter provide splendid beauty throughout the four seasons so that it is worthy of frequent visits. Within Japan, there are only 12 castles whose keeps survive today. Among those 12, Matsue Castle is the only one in the San’in region. It is also the 2nd-largest, 3rd-tallest and the 6th-oldest castle. Every part of the interior was designed for battle. Naturally, there are ishiotoshi areas to throw rocks which are hidden from the enemy, but there are also tsukeyagura (attached towers) that were built intricately to resemble attics for defense and monitoring. Underground, there is a huge 24m-deep well and a storehouse which were built during times of siege. Stairs made of paulownia to prevent fire and decay are a distinct feature not seen in any other castle. The top floor was designed in Boro style to resemble an observation tower so that a 360-degree view can be seen. There are no walls in any of the directions so that all of Matsue City, including Shinji Lake, can be seen with a wide feeling of openness. The interior displays are also not to be missed. Through a diorama, the course of the enemy, the defensive system going as far as the castle town and the location of the castle can be grasped easily. Murals depicting the stories surrounding the construction of the castle are also easy to understand, so that the more you know the more interesting the tour becomes. 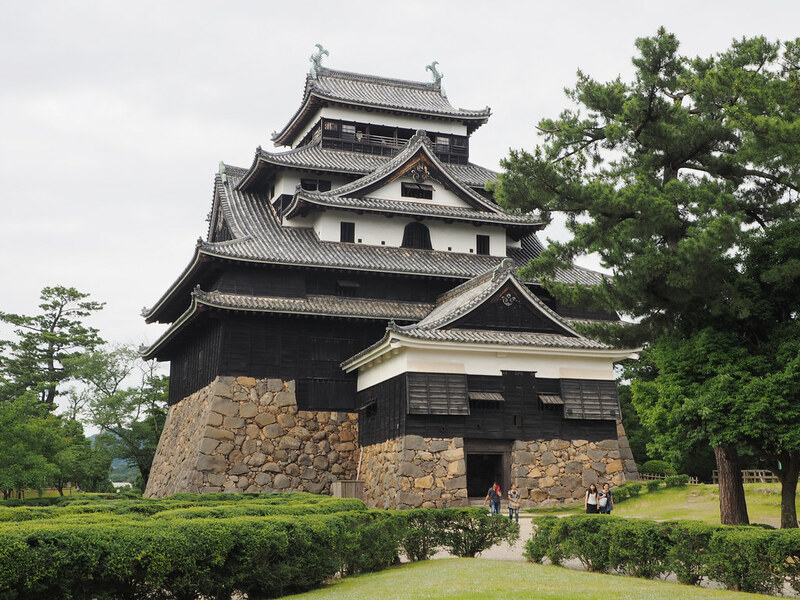 Matsue is also known as a riverside district so Matsue Castle which stands on the shores of Shinji Lake is also one of Japan’s Three Great Lake Castles. The 3.7km Horikawa Passage for small boats which has surrounded the castle since the time of its construction to the present day can be enjoyed for its elegant townscape of samurai residences and the old pine trees of Shiomi Nawate. Matsue Shiroyama Park is a famous place for cherry blossoms. With close to 200 cherry trees in full bloom within the park, the Castle Festival as well as nighttime illumination are held between late March and early April. The long-established Procession of Warriors is also well worth seeing. Brave warriors and brilliant princesses parade throughout the city of Matsue. Need help planning your trip to Hiroshima ? If you are interested to know more and save your time during your trip to Hiroshima, You can send a message to our local guides to get a customized itinerary and quotation for an unforgettable experience. Azusa-san was an excelent guide. We enjoyed every minute of out tour. She also made an efort to find gluten free restaurants for my wife. I had a small group of 7 people, all well travelled and looking for satisfaction in every aspect on a visit to Hiroshima where Azusa San led us beautifully. Her personality as well as her knowledge of the area was amazing. I just wish she could have led us on the complete trip of Japan.